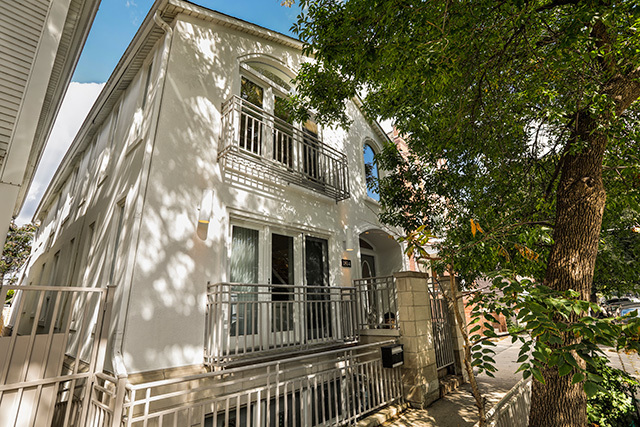 Beautiful 3-Level Wicker Park Home. High ceilings & tall windows welcome you to the open floor plan. New Bosch & Thermador professional grade appliances in the kitchen, paired with stunning quartz waterfall on the counters & on the living room fireplace. Entertain in the main dining room or upstairs in the family room; both have a wet bar! Upstairs boasts gorgeous skylights, an expansive family room, a second fireplace & an enormous master suite with steam shower & whirlpool tub. An upgraded staircase leads you to the basement with oversized marble tile throughout. High-end security features an ADT Alarm system already wired with 2 outside security cameras, a RING doorbell system with video & an electronic opener for the front gate. Many replacements, including LED lights, french doors, sump pump, gas furnace, and a water heater. An entirely new roof was installed in 2010 with warranty is a bonus! A block away from the 606 trail, this is a must see in the hot location of Wicker Park!